Tania Tarantola is a professional singer with training from the best music academies in Northern Italy, where she studied alongside famous contemporary Italian artists. A teacher of modern singing, she has also composed and performed famous advertising jingles. She is a regular performer at some of the most famous venues in Italy and Europe, drawing on a vast repertoire from a variety of genres to suit all occasions. Il Maestro Fabio Beltramini is a professional musician who has collaborated with the most renowned Italian and international orchestras, both as a guitarist and trombonist. He has performed solo in some of Italy’s biggest concert halls, as well as playing as a “session-man” and opening shows for leading Italian artists like Zucchero, Fausto Leali and Nomadi. He plays regularly at a number of venues across Italy, including Milan’s prestigious Blue Note, and composed “Ombra e il poeta”, a rock opera shown at the Leonardo theatre, Milan, that is in the process of being made into a ﬁlm. The acoustic two-piece is made up of Tania Tarantola (vocals) and Maestro Fabio Beltramini (guitar). They bring their own innovative acoustic covers of major current artists and all-time greats. “Tania & Fabio” perform as a duo, providing vocals with guitar backing in select, intimate locales (such as Ristorante Savini in Milan), with acoustic numbers tailored to the individual event. After the thrill of a live concert, whatever the genre or style, what better way to end the evening than with a DJ set to keep your guests entertained and have them dancing into the small hours. Trust in the duo’s experience in choosing the right tracks to match your musical tastes. Nothing brings people together like live music! 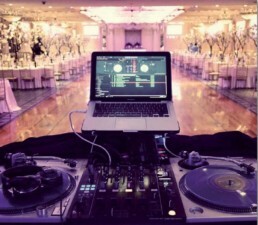 The duo’s DJ set, featuring their own musical choices and using various mixing techniques, offers a varied and uninterrupted set list featuring their own unique style and accommodating your preferences and your guests’ requests. Alternatively, other musicians and services can contribute to the event according to your specific needs.